“I just want to make them good citizens. If a child hears good music from the day of his birth, and learns to play it himself, he develops sensitivity, discipline and endurance. He gets a beautiful heart.” –Dr. 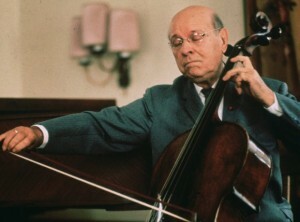 Shinichi Suzuki” “… perhaps it is music that will save the world.” –Pablo Casals, after being moved to tears by a performance of Talent Education students in Tokyo, 1961. The mother tongue approach. 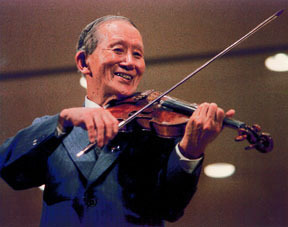 When Dr. Shinichi Suzuki created his method, perhaps the greatest challenge was discerning how best to teach young children to play the violin. He noted children’s innate ability to learn complex languages, such as Japanese and English by mere exposure. Through interaction with their parents and the act of listening and repeating sounds, children would easily learn to speak at a young age. Dr. Suzuki had an epiphany. He realized that by creating an environment where children were surrounded by music as they were surrounded by speech, they would be able to play an instrument as easily. Parent involvement. With the parent as a home teacher, children can begin sooner, and progress faster. Their home environment becomes one that nurtures and develops a love for music. The rewards for parents are numerous: a stronger bond with their children, shared joy of accomplishment and a sense of having made a worthwhile contribution to the their children’s development. Learn to play first, then read. Just as one learns to speak before learning to read, students in the Suzuki method learn to play by listening to recordings of the music they will learn, and playing pieces for memory before learning to read music. Pre-reading concepts are taught from the beginning to foster rhythmic understanding, and lay the groundwork for a natural progression into reading notes. The cultivation of a beautiful sound is of primary importance. Listening is fundamental. Students must develop listening skills in order to self-correct, while learning the skills necessary to play a string instrument. The Suzuki child’s ear is trained by listening to music daily, just as it is trained to hear the nuances of language pronunciation and accents. If the student repeatedly hears recordings of pieces played perfectly in tune with the desired articulation, he or she will develop a highly attuned sense of pitch, and the ability to sing and play in tune. Step-by-step mastery. Dr. Suzuki carefully selected repertoire to create a progression that introduces techniques and skills in a logical way. Each piece requires only a few new skills, yet reinforces those previously learned. 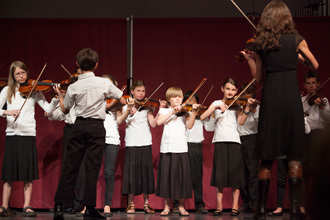 By teaching technique through pieces that are enjoyable to play rather than repetitive exercises, young children enjoy the process of learning. The private lesson. Although Suzuki students are known for their group performances, the weekly private lesson is the heart of the Suzuki method. Teachers tailor each lesson to the unique needs of the student. Special challenges receive special attention. As no two students learn in exactly the same way, Suzuki teachers enjoy finding ways to reach each individual, and bring out his or her natural ability. Class observation. Prospective Suzuki students and parents observe several classes before starting lessons. This opportunity to see what is expected of both parents and students in a lesson setting is an integral part of beginning study of an instrument. Home practice. Daily practice is necessary in order to progress. The speed of learning is directly correlated to the duration and quality of practice. Parents play a crucial role in the development of this daily discipline, offering corrections, and moral support. This is an opportunity to make learning enjoyable and rewarding for your child. Group lessons and fun! Don’t be surprised if you encounter Suzuki students playing while marching single file around a park or mall, or playing with their bows backward while standing on one leg. Group classes are eagerly anticipated because they are fun and motivational. They also provide valuable opportunities to develop ensemble skills, play with peers and experience the thrill of performing for an audience. Shinichi Suzuki began his revolutionary Talent Education movement in Matsumoto, Japan in 1945. His method is now taught around the world to hundreds of thousands of students, who play a range of instruments. 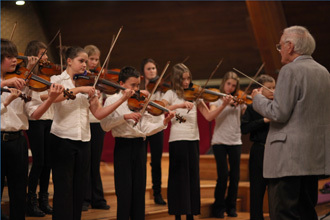 The Suzuki method provides a unique opportunity for parents to encourage and help their children to grow into well-rounded, confident individuals. The Suzuki experience creates bonds between parent, child and teacher that will last a lifetime. As Dr. Suzuki has proven time and again, given a nurturing environment, any child can learn to play a string instrument.